The statues are gray, too. Portland is a strange place. I like to call it Planet P because it is not of this Earth. It could be the weather, but I don't think so. This is my second winter in Portland, Oregon, and the weather is not as soul-sucking as the locals make it out to be. The first few months we were here, acquaintances (and the homeless person in the checkout line) told us winter is the pits. Brace yourself, they said. It is long. It is depressing. It is wet. My assessment is that winter in Portland is best described as gray. If I were the TV weather forecaster in Portland, my standard line would be: "Look for gray skies, followed by more gray skies, and whoa boy, gray is in the five-day outlook." Rain is secondary to the gray cloud cover. But the weather (excuse me, the gray) is not what makes Portland strange. People make Portland strange. I use the word strange in the broadest sense, not exclusively in the pejorative (negative). Strange can be good. 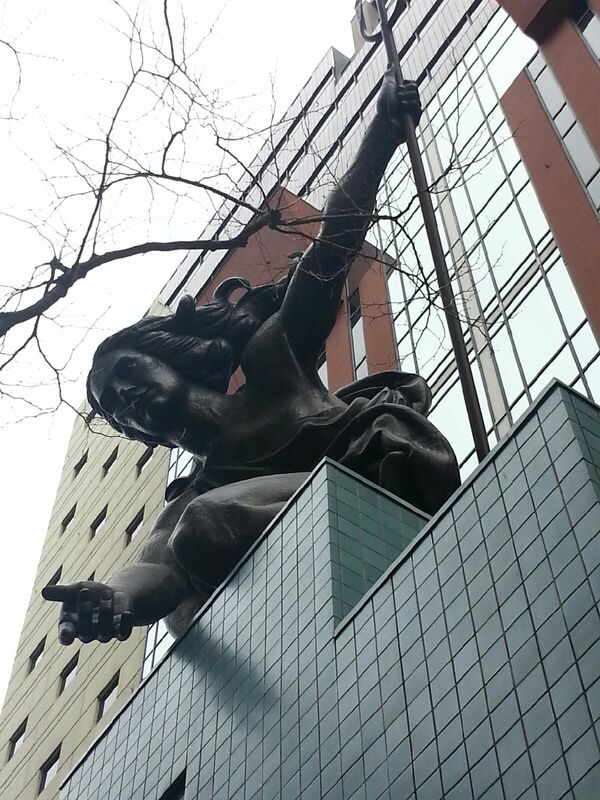 Portland is strange in good ways and bad ways, or shall I say, bizarre ways. Strange point #1: The food here is, hands down, tasty, innovative and off-kilter. I've never been more impressed with the use of bacon, artisan salts and macadamia nuts. This city is crazy about those ingredients, and the restaurants use them with flare. I had a fig and bacon sandwich with goat cheese on my birthday from a nondescript breakfast diner. A diner! for God's sake. There's a store across town that specializes in flavored salts (it's part of the niche store scene: there's a lightbulb and typewriter place that are equally cool). The macaroon here is like nothing I've ever eaten before. A macaroon to me is a drop cookie with the shredded coconut mixed in the batter. So far, I've seen nothing of the sort. Here, it's a sandwich cookie made in flavors such as salted (seeeee!) caramel, hazelnut and pistachio. In this case, strange is good. Yet ask a local, especially a local foodie, and he'll likely be hypercritical of the food scene. I could go on about the food carts (my favs are the cheese and cracker carts and the grilled cheese grill on a double-decker bus), but I won't. Strange point #2: Portlanders don't use umbrellas. If you see someone walking around with an umbrella in Portland, it's me, the only freak in the city who thinks she needs one. Strange point #3: The show Portlandia is pretty darn close to nailing the strangeness. I'm not exaggerating, and neither is the show. The place is full of young, urban, politically correct, highly educated, garage-band singing, DJ-spinning, writer-types. And loafers. Portlanders are great at loafing (me included). Again, not a criticism, just an observation. Maybe it's the lack of jobs or that within a five-block radius of every corner are five coffee houses, six bars, one or two "community spaces" and a couch in every grocery store. Portlanders walk, but they've got plenty of places to sit down while they do it. Oh, along with their Macs. Strange point #4: Showing off your creative entrepreneurial spirit or adventurous hobby is very important. What are you into? If you can't tell someone in 15 seconds the latest cool thing you've done (designed a new app for Microsoft, traveled to Thailand to build a school, learned Portuguese or run your third 100-mile race), you are a couch potato. No, you are more than a couch potato, you'll be getting few looks that mean: Next. Or, Wanna join me? Strange point #5: Clothes are optional. Strange point #6: Portland bikes. And unicycles. And tricycles. And kiddie cycles. And recumbent cycles ... and never stops. Even in the gray. I like Portland. It is always surprising me. LOL this is the best description of portland yet. Its great to hear from people that are "new" to the city. We lived there for years before moving out to suburbia and it is exactly as you described! This is perfect! I live in the 'burbs, but I spent a fair amount of time working in downtown PDX and this is EXACTLY what it is like. Great post! You hit the nail on the head. I never use an umbrella and can always spot a non-native. I hope to stay in PDX forever, mostly for the food. Love this! Oh how I love my Portland. Such a great city to live in. Very true observations!! Especially the first 4. Growing up around here, there are a lot of things about Portland that I didn't realize were weird, I guess until Portlandia pointed some of them out! It is pretty spot-on sometimes, if a little over the top. But really, only a little. I bet my husband would love to visit the salt store... haha! I'm not from here either, so I get every word of this post! I haven't seen pork belly and SPAM on so many things since moving to PDX! ALSO don't forget about the fixies! This is so true! Portland is a crazy, wonderful place! I could definitely do without the grey, though. This is all very true; it's a very strange and delicious town. Winters for the past few years have been mild, and before 1992 Oregon was much colder in general. So a lot of long-time residents will seem overly apprehensive of the winters. The last really bad winter was winter 2008-09 when Portland got snowed in with about two feet of snow--eveyone was shocked and unprepared. Oh, delicious. What a wonderful word to describe this place. I'm glad we have no snow. I'm not particularly fond of it. Thanks for stopping by. Come back soon!